10-Mar-2007 -- My approach to this confluence was from the north. Heading south on route 202 from exit 3 on the massachusetts turnpike (interstate 90), I crossed through Westfield, then turned west on route 57 at Southwick. The road began to climb as I reached the foothills of the Appalachians; not very impressive mountains in Mass. or Connecticut, but quite scenic, even though it was late winter and deplete of foliage. Ascending winding roads along ravines, I arrived at the highest elevation of the trip. near West Granville, at 400m. Turning south, I followed a snow covered dirt road through Granville State Forest, across the state line into Connecticut, and continued south on Rt 20 into the town of Hartland, which seemed to consist of no more than 3 old houses. Route 20 turned to the west, and within a mile, a right turn on Mill Street soon brought me to within 150m. of the confluence. The environment was heavy forest on all sides. One or two dwellings on the street did not approach the position I had chosen for closest approach. 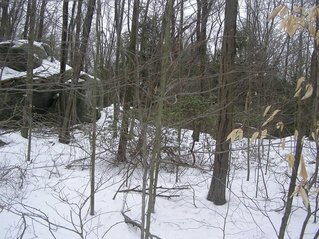 I hopped a low stone wall bordering the street, and walked directly east along a flat area which appeared to have been partially cleared of low shrubs and branches, leaving the larger trees intact. Beyond this zone, a broad gully appeared. Descending into the gully was tricky with the hard packed snow cover being slippery in places. The bottom of the gully contained collections of huge boulders. The forest floor was open & easy to walk. Numerous stone walls could be seen traversing the woods. Stands of mountain laurel provided the only greenery in the scene. I arrived at the confluence 20 meters south of the largest glacial boulder. It was difficult to zero the GPS with all the overhead branches. The woods were stark and eerily silent. I could hear the crunching of my boots in the snow echoing off the big boulder. I saw no birds or animals. The large vegetation was predominately oak, hickory, and maple. I took my pictures and left the gully, retracing my footprints in the snow. As I approached the street, I was surprised to find a police car parked behind my Jeep, along with a very serious officer, prepared to ask many questions. My explanation of confluence hunting did not win me any points; I was guilty until proven innocent. After a lengthy electronic examination of my identity, I was declared harmless and allowed to go. I was reprimanded for walking on property without seeking permission from the landowner, and threatened with a citation for trespassing. I suppose every piece of land on Earth is owned by somebody; but I never expected to be thus challenged in such a remote, empty, and untrodden place.